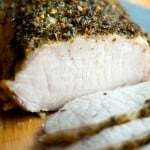 This Herbs de Provence Encrusted Pork Loin is a must try for Sunday dinner or holiday gatherings. The fragrant flavors of this dried spice go perfectly on chicken and fish as well. Herbs de Provence is a mixture of dried herbs containing savory, marjoram, rosemary, thyme, oregano and lavender. If you’ve been a CEK reader for a while, you also know that I generally don’t use many dried herbs in my cooking. However, when I saw this package of herbs while out shopping recently, I had always wanted to try it. After all, they did contain many of the same flavors I love to cook with. 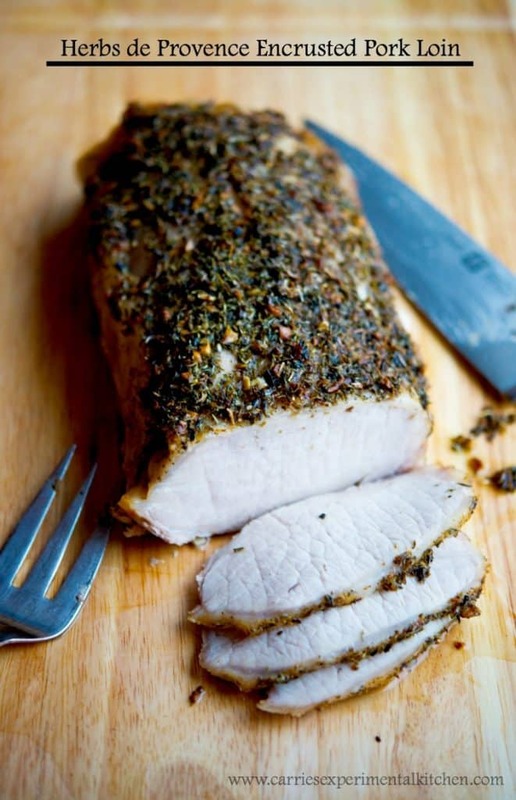 This Herbs de Provence Encrusted Pork Loin was exquisite. Not only did it look gorgeous, it was deliciously moist and aromatic. I decided to use Chardonnay wine as the base for my gravy, which added another delectable nuance to this dish, but if you prefer to not cook with wine you can substitute all chicken broth. Whichever you decide to use, do not baste the meat during the cooking process so you leave the herbs in tact. 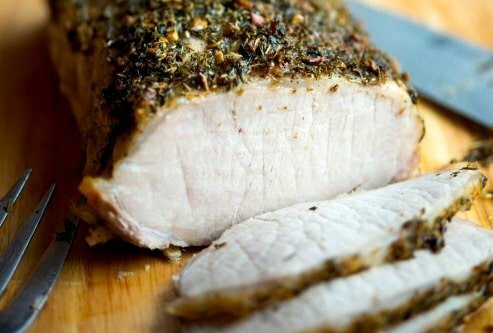 This pork loin is so easy to make, it makes a wonderful dish for a crowd for either Sunday supper or for any special occasion. ~Enjoy! Allow meat to come to room temperature for 15 minutes prior to cooking; then trim any visible fat from your roast and place in a roasting pan; leaving any fat facing up. Combine the Herbs de Provence, garlic, oil, salt and pepper in a small bowl; then brush it on top of the meat. Remove the roast from the oven and allow to sit for 15 minutes before slicing. Remove the pan drippings from the bottom of the roasting pan and place in a small saucepan. Bring to a slight boil over high heat; then reduce heat to a simmer. Combine the cornstarch and cold water and whisk the mixture into the pan drippings. Stir constantly until the gravy has thickened; approximately 2-3 minutes. This looks delicious! I may use this recipe for my sweetie for valentine’s day. This recipe was easy and delicious. I made just one adjustment and added lemon zest to the spice rub. I wanted to brighten the flavor a bit. Sounds wonderful to me Claudia! Thank you for stopping back to let me know! Made this for dinner tonight – it was wonderful! It reminded me of a dinner I had when I went to Paris with my daughter. It was so simple and yet tasty. I didn’t measure everything and I added some minced sweet onion, and used the “Simply Organic” brand of Herbes de Provence. I love this recipe as well Barbara because of it’s simplicity. I’m so glad you tried and enjoyed the recipe! We made this last night. Very very tasty! And FINALLY had a use for my Herbs de Provence, which I bought because it was pretty and has been collecting dust on the shelf! Thank you!